Four years after Nigeria survived an outbreak of Ebola, West African Health Organization Director-General WAHO, Prof. Stanley Okolo, said that during the Ebola epidemic in 2014, the subregion lost $ 7 billion in loss aid, income and productivity. Okolo's presentation during the Regional Disease Surveillance Systems Enhancement (REDISSE, 3rd Steering Committee meeting in Lagos last week) called on countries to prepare for emergency response to avoid economic, human and other losses. He also pointed out that the region had learned lessons in areas such as a poor surveillance infrastructure, poor information exchange and cooperation, a poor emergency response and insufficient funding. "We were involved in the Ebola epidemic in 2014 and had nearly $ 7 billion in lost productivity, lost income, lost tourism and help, which is probably only in terms of costs, we're not talking about the nearly 12,000 brothers, sisters, Children and women who have died, we must not have that again. "So, a lot of work is going on, but what I really ask for is to move forward and challenge each other; He also told our leaders that they are picking up and acquiring the models and tools to be prepared and combat diseases. "At the one-week meeting to ratify the recommendations of the Subcommittee in Lagos, Okolo said that the REDISSE project was one of The World Bank-funded regional project covering all 15 ECOWAS countries and Mauritania in five-year phases from 2016 to 2023. It announced that 11 of the expected 16 countries have so far signed up for the REDISSE project and that REDISSE comprises five components including monitoring and health information, building laboratory capacity, preparedness and emergency response. "I urge the 15 countries in West Africa to stay ahead of the pack because those involved in epidemics and emergencies know they are facing major economic problems , It is important to say that the first 48 hours of an epidemic are critical, and what will be done depends on how well you are prepared within those 48 hours. "The epidemic responsibility depends on the ease of readiness and the system in each country, in other words, readiness as a response depends on the willingness of each country." So we examine how our individual countries use their system, their staff in Set up monitoring to obtain information from all districts, all public health communities and how they analyze the information. Okolo, who emphasizes the need to improve on the lessons learned from the 2014 Ebola epidemic, said: "In the region we have set up super regional laboratories, 12 of them in West Africa for human reference analysis and another two for veterinary medicine how to educate people, epidemiologists, to support the countries, we have 3,000 supporters across West Africa. "World Bank representative John Paul Clark said the meeting provided an opportunity to discuss the challenges facing them all face each other. He added that the meeting would help them develop strategies for using WAHO resources. "We are also committed to providing timely technical support and support to help the bank overcome some of the bureaucratic obstacles and streamline procedures." 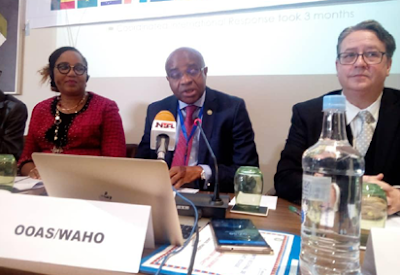 REDISSE Project Coordinator for Nigeria and Director, Disease Surveillance, Nigeria CDC, dr. Olubunmi Ojo said: "There is a need to restructure the distribution of the fund, disease surveillance is at the base and we are trying to improve surveillance, the laboratory and awareness."